Babies are now born with over 200 chemicals in their umbilical cord blood. Some of these toxins will come from the home, such as personal care products, insect spray, air fresheners, food additives and pesticides. Children can’t detox these chemicals as well as adults and their brains are more susceptible to damage. Water bottles – if your kids are using plastic water bottles, switch them over to stainless steel. Plastics are full of harmful chemicals which will affect hormones, as well as behaviour. When buying a stainless steel water bottle, make sure it isn’t lined with plastic. Water – if you don’t have a water filter, it is wise to invest in one. This will remove many contaminants from your water supply. An added bonus is that the water will taste better too, which will encourage people to drink more of it! Food containers – again, if you have plastic, try to phase them out and phase in glass and stainless steel. Schools generally don’t like glass lunchboxes, so use stainless steel for school. Supermarkets will often do half price sales on pyrex containers with lids, so stock up when they are on offer. For pantry storage, just reuse glass jars. Tinned food – buy a minimum amount of tinned food. The cans are lined with chemicals which then leach into the food. 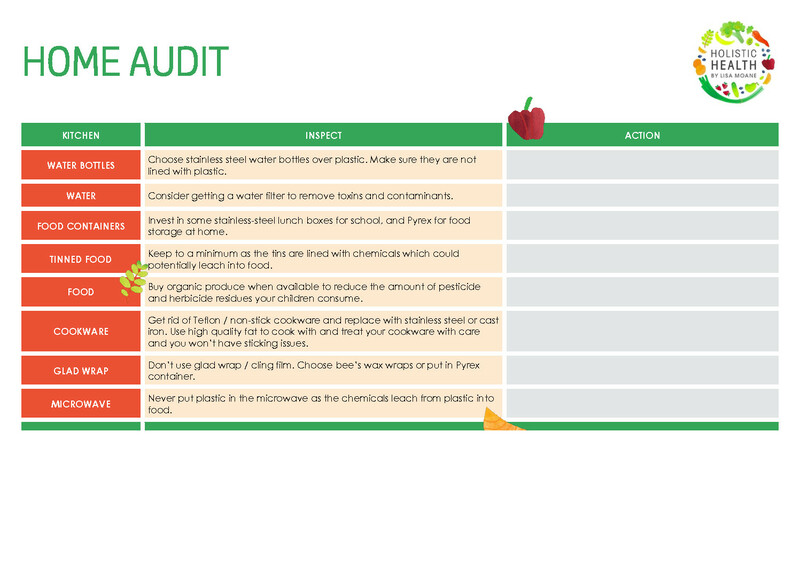 Pesticides – chose organic food as much as possible. Find a local grower who at least uses organic, spray free farming principles and get a weekly box delivery. Alternatively join a co-op and buy directly from the organic growers markets. Cookware – throw away the non-stick frying pans, especially if they are showing signs of wear. Invest in some quality stainless steel or cast iron, and use high quality fat to cook in. Glad wrap – this is totally unnecessary. I don’t think I have ever bought it. Store food in reusable containers instead. Microwave – if you use a microwave, never ever put plastic in it, as this will quickly leach the chemicals from the container or glad wrap into the food. I go through the whole house in my online program, not just the kitchen! If you would like do this, join here.